Nursing Behind the Wall has now expanded to included gifts for those special Correctional Nurses! Oval Nurse Behind the Wall decals are now available here on our website. Other items are still available at Zazzle - Nursing Behind the Wall that can be further personalized to suit your needs. If you need a token gift for Nurse’s Week, or to celebrate NCCHC or ACA accreditation, Nursing Behind the Wall can design the perfect memento. We will work within your budget to get your staff something they can appreciate and truly use. 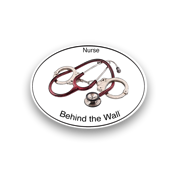 Please visit our web store and our Zazzle store, and as always, contact the Nursing Behind the Wall Store should you need assistance with questions or product customization.